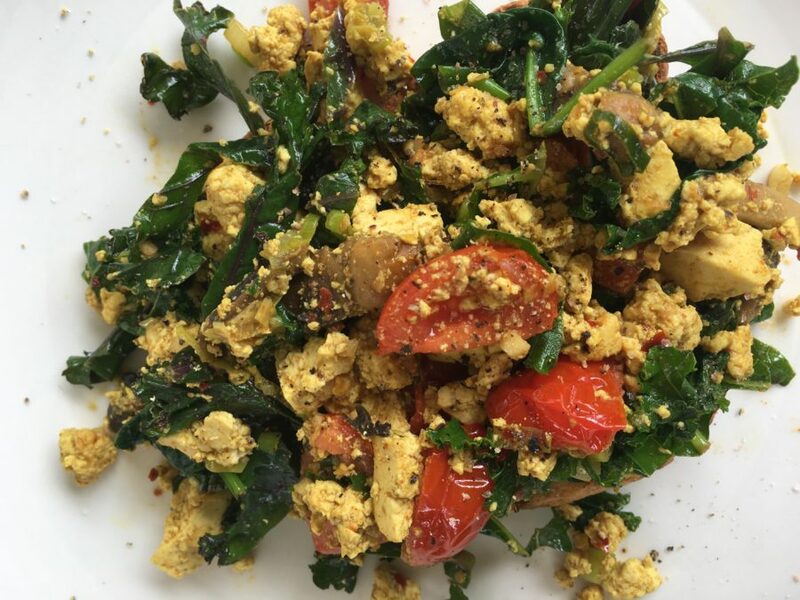 Scrambled tofu is a popular quick and easy substitute of eggs for vegetarians and vegans. 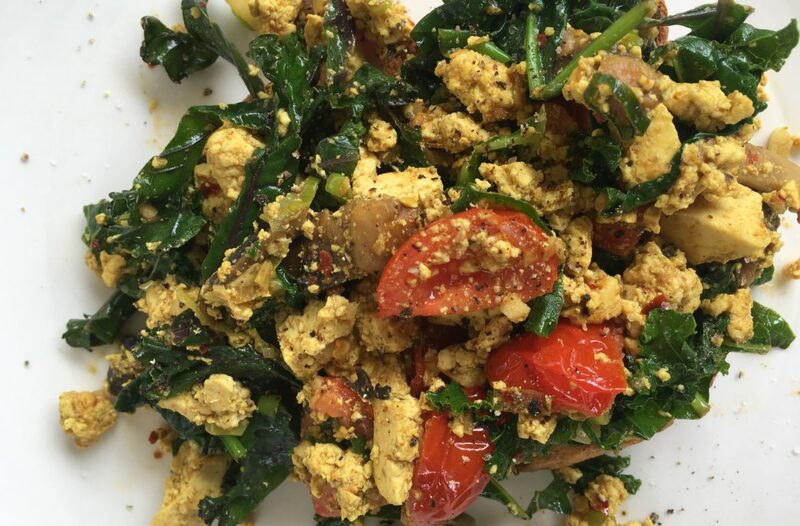 High in protein and contains all eight essential amino acids. It is also an outstanding source of iron and calcium along with the minerals manganese, selenium and phosphorous. In addition, it is a good source of magnesium, copper, zinc and vitamin B1. As it has a tasteless flavour, it adapts to whatever flavour you want. Mix together nutritional yeast, turmeric, cumin, paprika, chilli flakes, water, salt, and pepper in a small bowl and mix to a paste. In a medium size bowl add tofu and paste, crumble together breaking it up with your fingers and mix well, trying to colour as much tofu as possible. Grease a frying pan with coconut oil and place it over medium heat. Once hot, add spring onion, garlic, mushroom and tomatoes and sauté until fragrant, about 2 – 3 minutes. Add tofu mix and combine with vegetables and then stir through mixed greens cook a further 2 minutes or until greens have wilted. Once cooked, serve with extra salad or on toast. Please leave me a comment as I love to hear from you, keep in touch! I am a happily married mother of 4 and nana to two grandsons. I want to inspire and empower others to Be Well! To live a healthy lifestyle and feel vibrant by eating nutritious, whole foods and by engaging in regular exercise. Discover how the correct fuel for your body provides you with more energy and wellbeing! GET MY FREE "5 DAY FOOD CHALLENGE!"